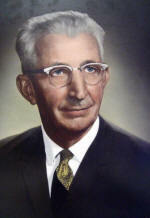 Dr. Hiram F. Thut, for whom the greenhouse is named, taught at Eastern Illinois University from 1933-1969. 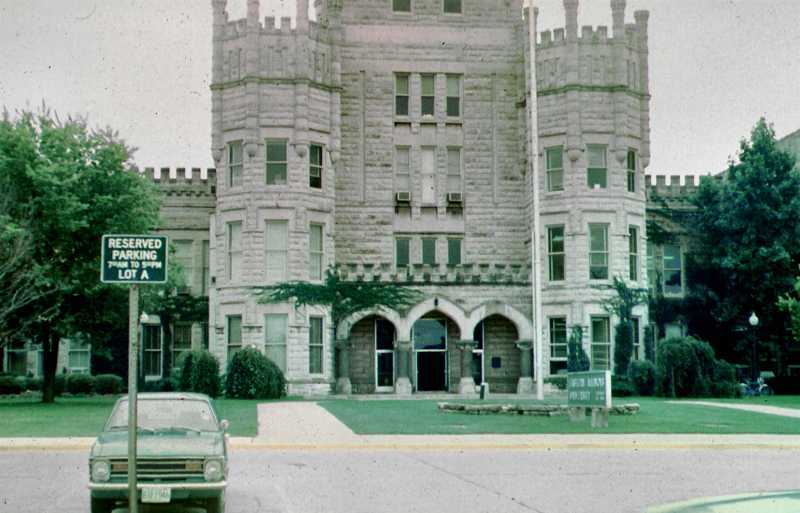 During the last year he taught at Eastern, Dr. Thut put together a slide presentation showing Eastern Illinois University and surrounding areas throughout the years. A version of this slide program was first given to the Alumni at Pemberton Hall in 1969 entitled, "Forty Years At Eastern." On November 14, 1973, Dr. H. F. Thut, Professor Emeritus of Botany, gave as his final talk to the Botany Club, a program entitled "E.I.U. : Then and Now." The "then" slides went back 40 years and more, and even some of the "now" slides look strange today. David Murphy of the Botany Department recognized the historical interest of this program and taped it. After Dr. Thut’s death the following year, Mr. Murphy worked with Mrs. Thut to locate the slides and copy them during the summer of 1978 so that the entire presentation has been preserved. Slide facts were taken from notes on the original slides, notes of Dr. Thut, and personal knowledge. 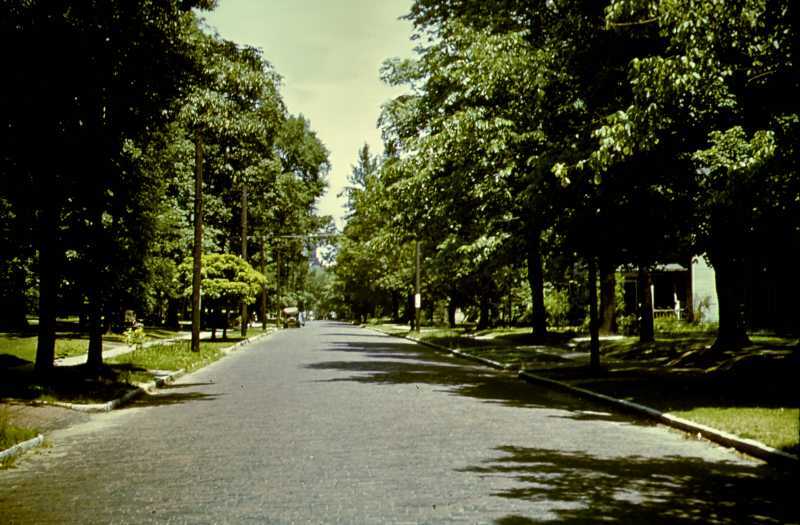 Bishop's Woods comprising 40 acres was acquired by the state in 1895 for $3000 during the administration of Governor Altgelt for use as a college site. 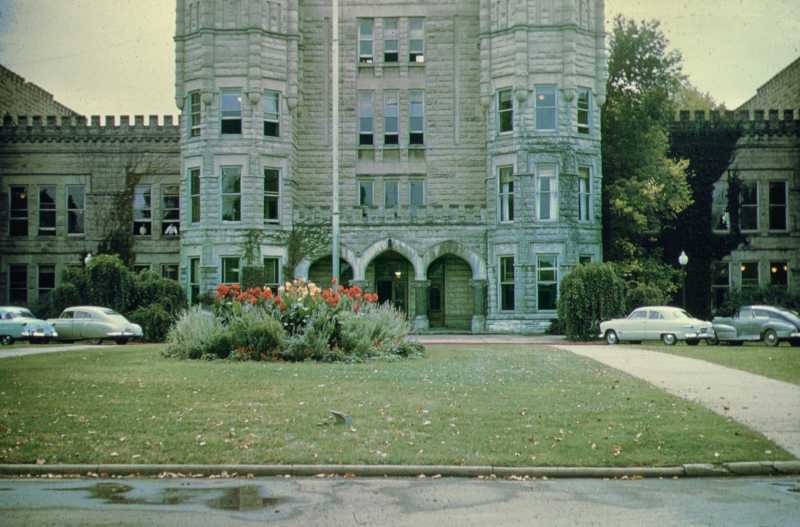 Indiana limestone was the preferred material for the construction of Old Main thus bypassing Embarras stone. The pictures begin with my arrival at Eastern in the fall of 1932; however a few slides of Charleston and surrounding areas were derived from other sources which have been acknowledged on the individual slides. When you carry a camera around, you take incidental pictures. It's been kinda fun, but I should have been told 40 years ago that I was going to have to give a speech. I have 80 slides in this batch and I ought to have 20 good slides. And if the Chinese expression "a picture is worth a thousand words" then with 20 slides, my lecture is 20,000 words long. So, I think without further ado, I will show you some pictures around Charleston, Illinois. 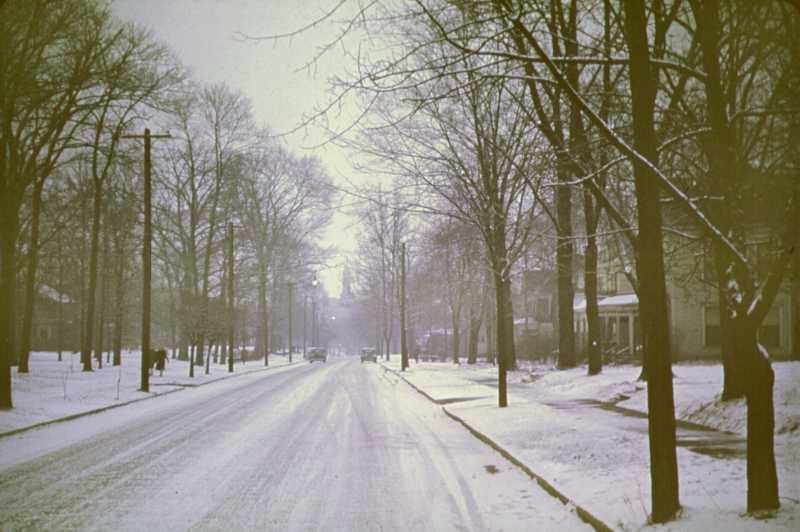 Summer, 1940; Fall, 1940; Winter, 1941 and Spring, 1941 If you have ever driven a car on Sixth Street and have seen this sight, you were in the wrong. This is sixth street looking north - and you're not supposed to go north on Sixth Street. This is just beyond Polk and there's the courthouse. Don't you see the courthouse? All of us know in a deciduous forest area we have Spring, Summer, Fall and Winter and that makes for some happy seasons and makes for change. So, here is Sixth Street --- all approximately at the same spot. Sketch of the campus plans by DuBois, the architect, as drawn in 1899. I found in the Planner's Office an old, old record of sort of a sketch of the campus. The campus is as you know Fourth Street and Seventh Street and Cleveland and of course at the top is Lincoln. This is Old Main. Right there and behind Old Main, not very far, is the power house. If you ever have a good friend in the maintenance department you can go in Old Main and walk under what is now the Art Exhibit Room -- it used to be called the Old Auditorium -- you could walk underground through a tunnel that goes over to the power plant and a tunnel that goes over to McAfee Gym. 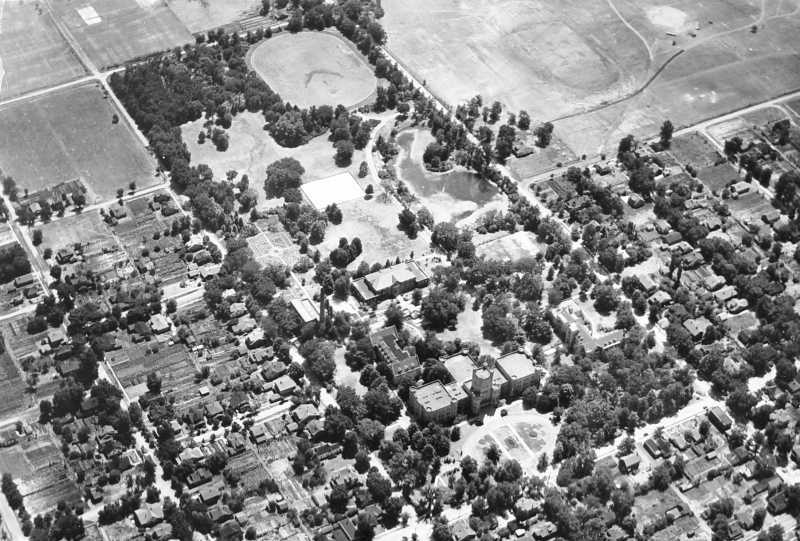 The campus not only had a circle in front of Old Main but there would be a road here and a lake right there. Now the lake never grew this big, in fact the lake was a little farther north than this sketch illustrates, but you see, this is quite a sizeable lake and here on the other part of it, is the road, it continues around... So this is the scheme of the campus. And because Charleston promised that they would supply the college with all the water that they wanted, it was going to have a lake. Well, since we got water for nothing, we could fill up a lake. But after a few years it got so expensive that the town reneged on supplying us with water to fill up the lake and we had to buy the water for the lake as well as the water for everything else we needed for campus. Now this lake was built from what was partially an old tile mill... the plants on this picture are schematic. The campus had a few trees here and they called it the grove at the south end of the campus. [This was the original] 40 acres. 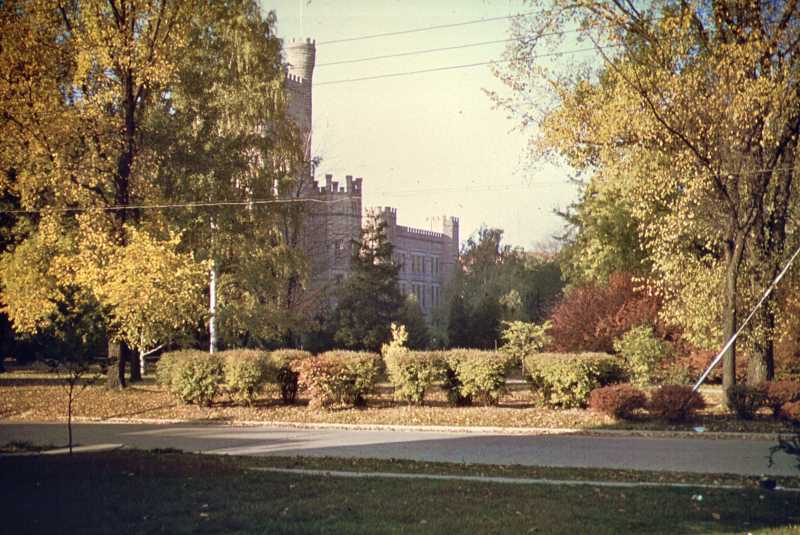 Old Main, 1954 and 1973. Old Main of course had an oval in front and you can see that the cars are parked right by the front door way back when people couldn't walk quite as far as they can today. But they've moved the parking area a little farther out and of course they widened Lincoln Avenue. Aerial view of campus ca. 1935. Now, here's a picture I've borrowed, an air-view picture and you can see Lincoln Avenue here, just a side street, so to speak, a little two lane road. Now there's the oval and you have to remember that Old Main was the only building on the campus 60 years ago and in Old Main they had everything that happened at the college. They had elementary grades. They had some high school youngsters. In fact much of the work at the beginning of the school was more or less high school work because these people had to catch up on grade work so they could go out and teach. So this castle was originally just a teacher-training institution for elementary grades, primarily. Corner of the campus at Seventh and Lincoln in early years. Here is Old Main and we had a botanist by the name of Otis Caldwell and he was quite a famous chap. He left here and went to the University of Chicago and then he went to Columbia and he became General Secretary of the AAAS for years and years and years. I met him on many occasions and he always had a very kind feeling for Eastern. It was surprising how he was so taken with how he had enjoyed Eastern. Now, many of these things in front, Caldwell planted. 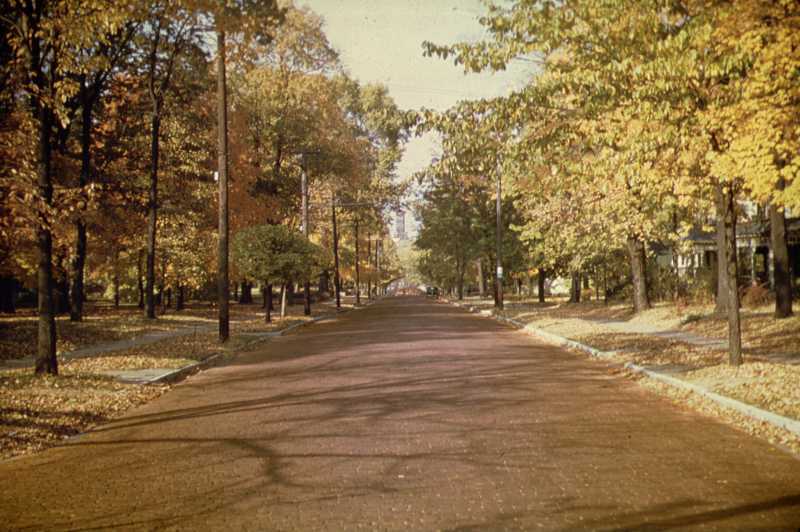 He planted a lot of tulip trees, horse chestnut, maples, cottonwood and many of those along Fourth Street disappeared. And the oldest tree, there I think that's part of it, the oldest tree in the circle was a hickory. I counted a hundred and seventy-five rings. So that tree was there when the building was built and the circle did not eliminate the hickory. 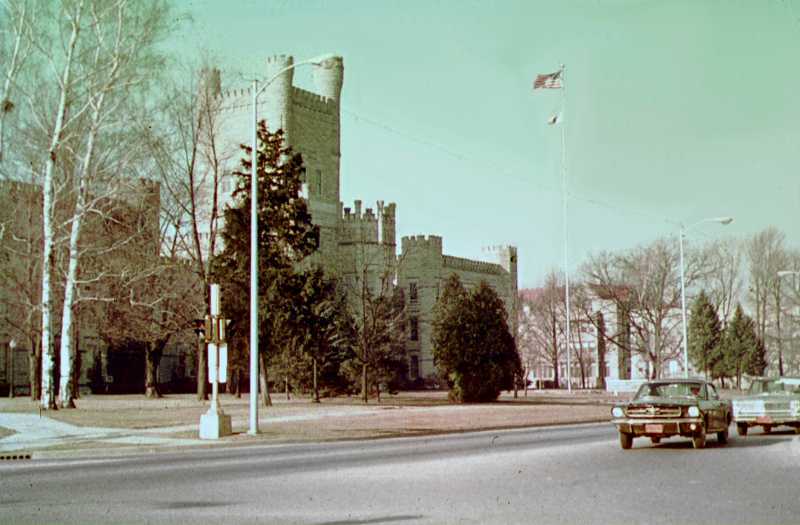 Old Main after widening Lincoln Avenue. Same picture, but you see we've eliminated an awful lot of the trees. And the trees that they cut down at the time were exactly the same age as Old Main because Mr. Caldwell arrived first and after two or three years he bought some trees to plant out front. But, you see, he bought two or three year old trees and the campus was also three years old, so you could count the rings on the trees and you would know exactly how old the building was. 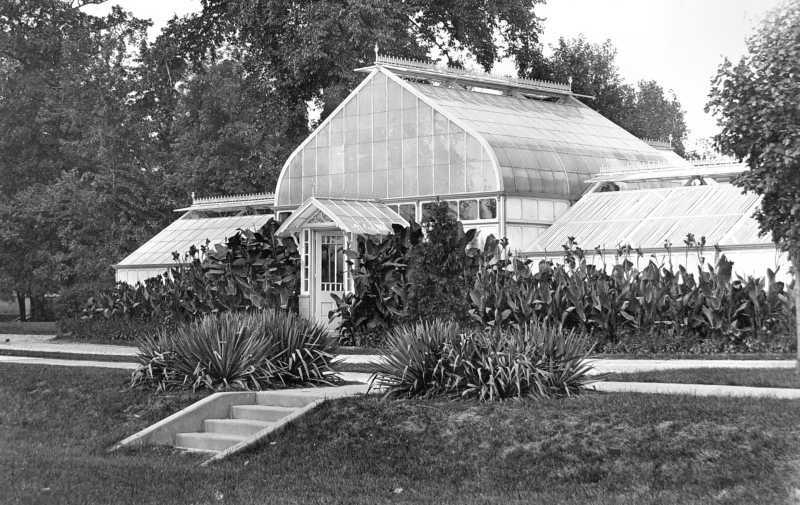 Greenhouse as built in 1903. Now the power plant was just behind Old Main. 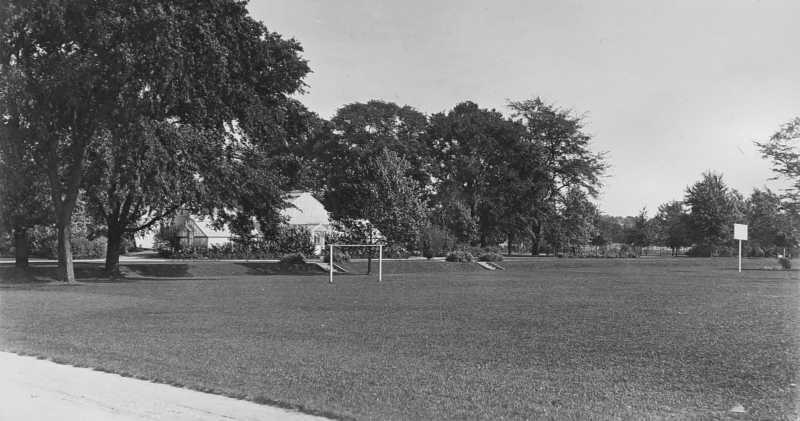 The first building on the campus, due to the energies of Mr. Caldwell was a greenhouse. And, in this greenhouse Mr. Lord was happy that the youngsters could see bananas growing and orchids growing and some other tropical plants so he was happy to have a greenhouse, just back up against the power plant. South of this place was then filled up when they built what they used to call the Home Ec and Industrial Arts building. Now its called the Student Service Center. Hockey field, 1912. Now we're looking northeast and there is the greenhouse and this is the hockey field, although they occasionally did play football and you see they had a drive around the greenhouse and it was a little higher up than this hockey field. Right here, today, of course, is the Union building. 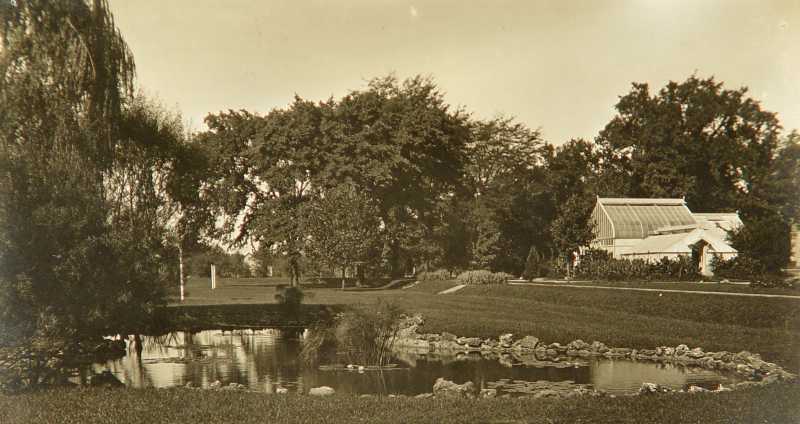 Lily Pond south east of the old greenhouse, 1912. Looking northwest, looking at the greenhouse, there was a lily pond. And, when they built this Industrial Arts [Student Services] building the lily pond disappeared. Now the next picture is standing approximately in this lily pond, although it wasn't there, and we're looking northwest. Ready? Site of the old greenhouse looking toward Pemberton in April, 1969. Don't you see the greenhouse right there? That's the greenhouse right there. So it was, as I said before, just behind Old Main and right approximately in that position. Of course the greenhouse was steel or iron and glass. And of course the iron rusted pretty badly so that the last several years the greenhouse was held together by nails and wire and goodness knows what else. They propped it up for several years and when they pulled it down, they pulled on it and half of it collapsed. So it was pretty well gone. 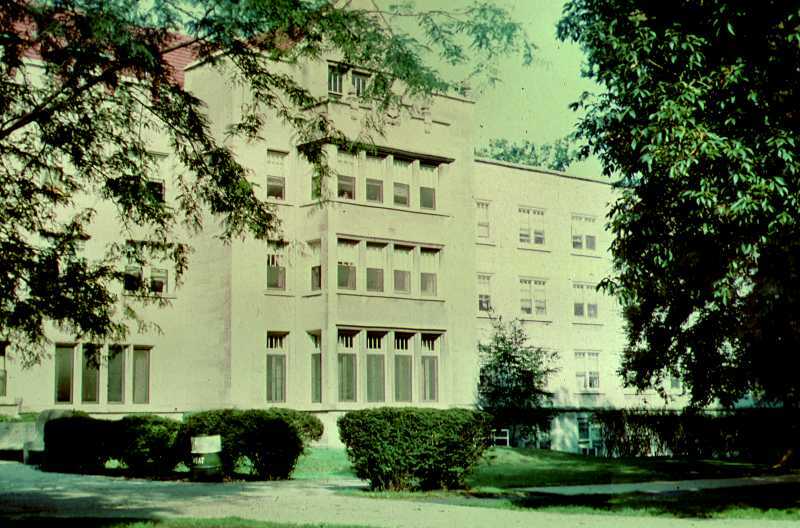 Pemberton Hall, 1973. 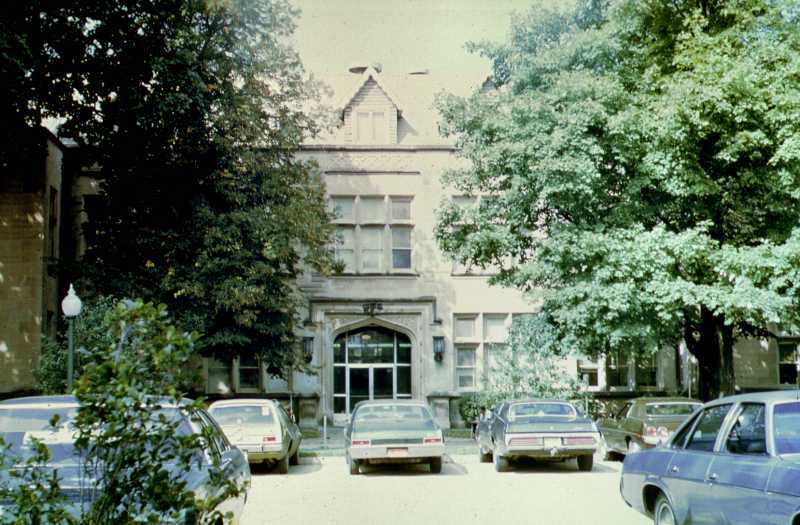 Of course, the second building on the campus was Pem Hall [built in 1909]. I wish I had an early picture. This is Pem Hall and the Cracker Box [now Textbook Rental on the south side]. The Cracker Box was the gymnasium. The only way that the school could get a gymnasium was to hitch it onto the girl's dorm. So in this bookstore was where we used to see basketball games. Apparently before we had this basketball court they played basketball on the top floor of Old Main West. Some of those walls weren't in there then, so they played basketball up there. But up to there was Pem Hall when we got here. And many of the social functions of the school, including the Faculty Christmas Dinner were held in Pem Hall. [Many school dances were held in the Cracker Box]. 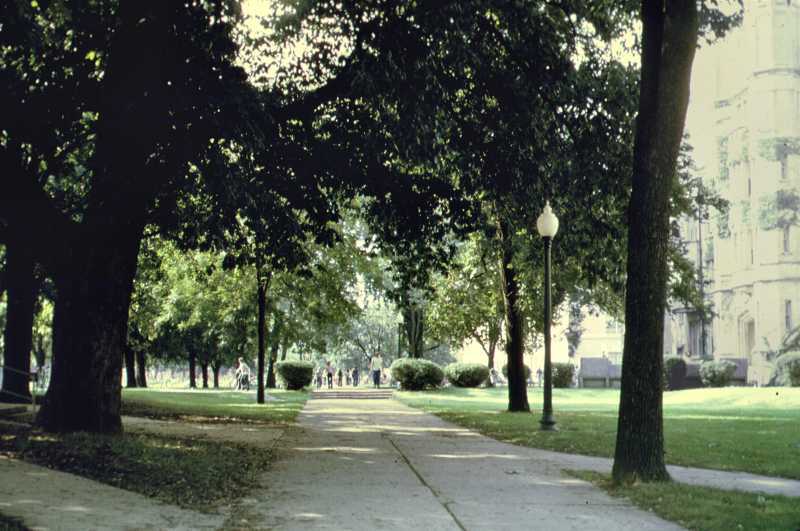 West end of Old Main in September, 1973. 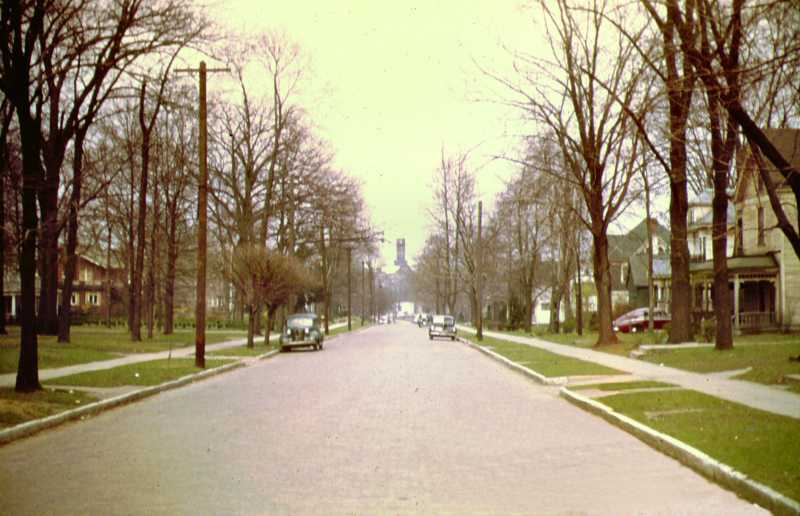 I think all of you have seen this picture from Lincoln Street looking south you can see Pem Hall to the right. Beyond it of course is the Cracker Box. Beyond that of course is the Physical Science building, ad infinitum. The third building of course, was the Model School which became the Training School which became Blair Hall which was taken over by the Commerce and what was the other? Business Department. It started out as a Model School and Mr. Lord thought you ought to have good illustrations of teaching. We taught on Saturday so that the teachers of the surrounding area could come in and observe student teaching in the Model School. I should add there is a road right along the front of this school and it's the road that went around Old Main and the greenhouse and past this building. The school garden, 1912. Each grade school class had a plot. Now there's Old Main, we're looking north. Mr. Nearling was grounds man. Mr. Nearling had, I think, an Instructor's rating and all the youngsters in the training school had plots and they raised garden stuff in these plots so they had red beets and tomatoes and everything else including weeds growing in their garden plots. 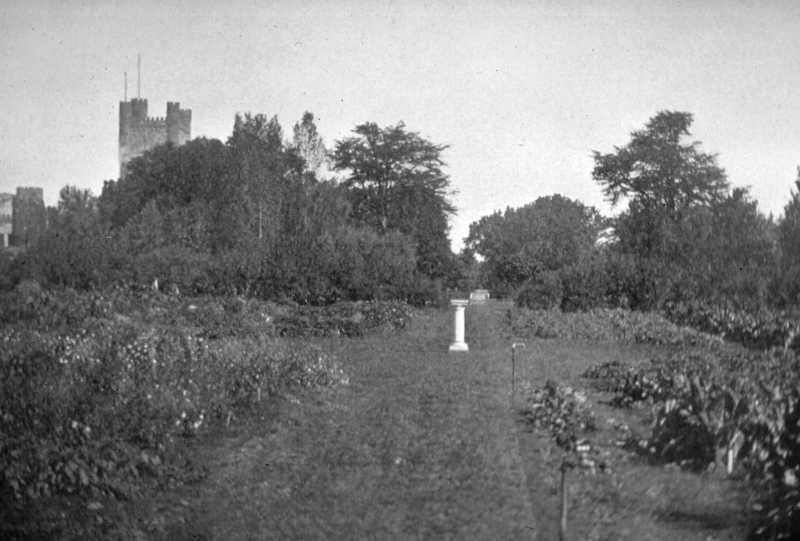 Garden south of the power house, 1938. When Dr. Buzzard arrived... Dr. Buzzard was an iris man, and so the iris plants moved in [to this garden plot]. We were looking north - now we are looking south. 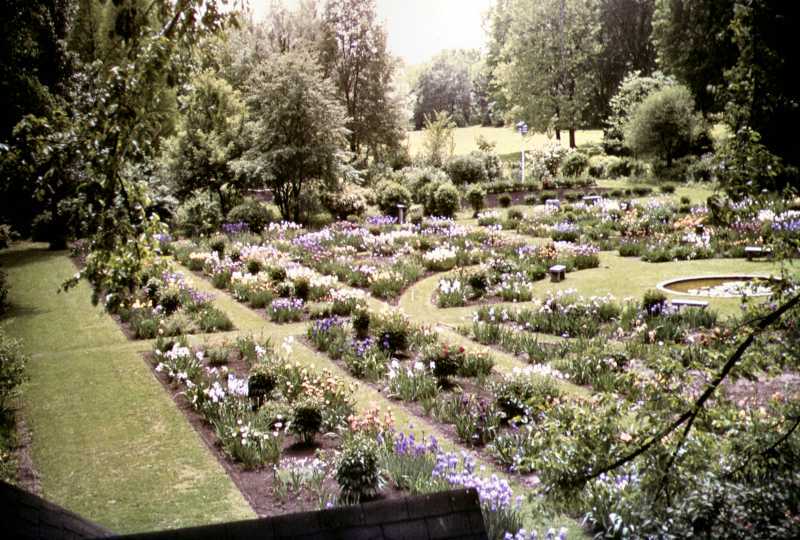 And these are peonies, you can see the peonies and iris, so that south of the power house was this garden. And they put in a little lily pond. And I don't know if any of you can remember back this stage or not, but I would think some of you could, because this was Mr. Buzzard's pet flower garden, and for one or two weeks of the year it was very lovely. There was nothing on the far [east] side, just nothing, except the trees, of course. Then the area became Quonset huts for the grades, but then it became something else - are you ready for something else? 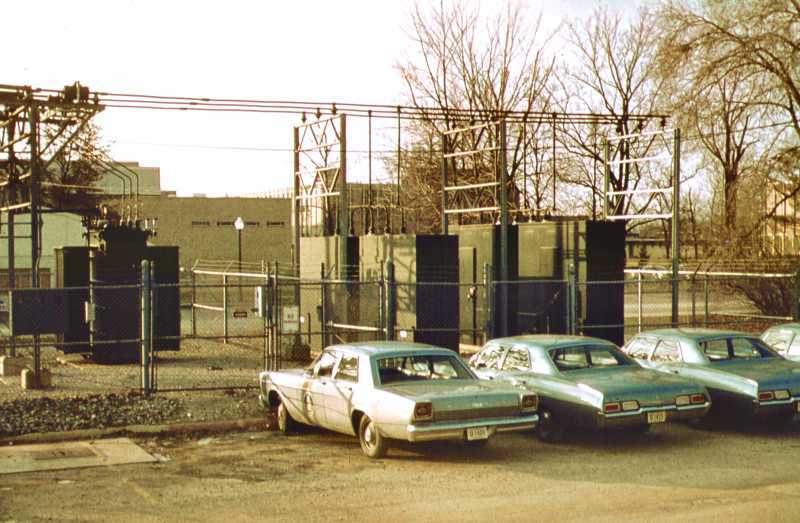 Electric transformers south of the power house in 1967. This is approximately the same picture in the location that the garden was and I think all of you recognize this. But, there was a beautiful flower garden here.